- fun and exhilarating, & close to San Jose! This can be your closest and cheapest choice for white water rafting near San Jose. - A midday tour is also possible. Whether you are using GPS and driving or enjoying the ease of being picked up at the door of your condo, you will have a beautiful trip on your way to the Chirripo river on the Caribbean lowlands. From Parklands Vacation Condos you skirt the northern metropolitan area before you head over the mountains and through a tunnel to traverse the splendid cloud-infused jungle covered mountains of Braulio Carillo National Park which boasts one of the highest levels of biodiversity in Costa Rica. It is estimated that more than 90% of the park is densely covered in primary forest - giving the visitor a view of ancient ecology preserved. The Chirripó River originates on the northern slopes of the Irazu volcano. Due to volcanic materials, it's clean water is not clear but rather a natural reddish-tan color. The river slowly and progressively drops over a boulder laden river bed and shore. Trees such as the Cecropia, Sotacaballo, and Chilamate, dominate the Caribbean low-land vegetation stretching along the length of the Chirripo River. On arrival at the Chirripo River, participants receive thorough safety instructions before the rafts are ready to be launched. Safety gear is provided, and passengers are divided into small groups to practice the basic rowing techniques and familiarize themselves with the guide's commands. When everyone is ready, the groups launch with nerves and excitement into an invigorating 8 mile stretch of the Chirripo River. The guides encourage you and help you feel secure, as rapids come and go, you soon gain confidence. As you quickly gain confidence with the rapids, you might like to momentarily take your glance off the water to search the trees for a possible hidden bird, sloth or lizard. There also comes a chance to stop, climb an embankment, and leap back into a deeper part, slightly upriver from the waiting rafts. Half way down the river, everyone gets a chance to stop and enjoy a snack of fresh tropical Costa Rican fruit. It's fascinating just to watch how the guides prepare the fruit so fast and decoratively, and it's a great energy boost needed for the next set of rapids that are left to conquer. Boulders are passed, other rivers join and leave, and the rafts continue the flow of water winding and keeping momentum rapid after rapid. It's exhilarating yet refreshing. Then finally, after about two hours of solid physical activity, rafters arrive at the finishing point. Get out of their gear and into the van and then to the rafting company's storage area for hot showers and the chance to change into dry clothes. For those buying the transport package as well, a wonderful and complete hot lunch is waiting at a nearby restaurant, and a chance to say farewells and thank the guides for one great rafting experience! The ride back to your lodging in the capital takes you back through the majestic mountains natural beauty of Braulio Carillo National Park. Light Package: $45 per person to self-drive, and does not include the hot lunch & juice at midday. 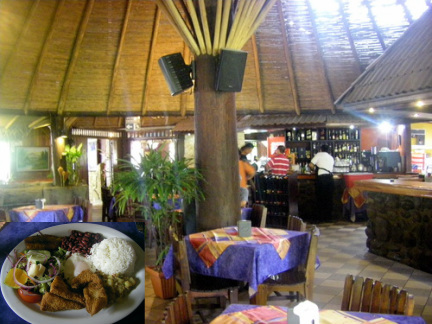 The hot restaurant lunch and fruit juice drink can be purchased separately for $15+ p/p. But transport is still NOT included. *Full Package: $75 per person for door to door transport from your Parklands Costa Rica Vacation Condo or major hotel in the metropolitan area of San Jose, and includes the hot restaurant lunch and fruit drink & taxes.